The owners of this extraordinary home located on a sprawling lot in one of Yorba Linda's premier neighborhoods, pulled out all the stops when creating the ultimate environment for entertaining within its fabulous 4,355 sq ft floor plan & stunning 980 sqft backyard loggia. Designed by an award-winning restaurateur, the patio is accented with stone imported from a rock quarry in Tennessee and features a large living area with fireplace & multiple LED TVs, high-pitched tongue & groove and box beam ceiling. LED track lighting, commercial gas heaters, & a culinary and prep space with restaurant-level equipment such as an Evo Griddle, Big Green Egg smoker, Kalamazoo Hybrid Fire Grill, Fire Magic 24-inch power burner & Wood Stone gas pizza oven. The bar area features a speed rail, two-head tap tower, three sinks, & garbage disposal. Overlooking lush grounds with pristine lawns, fire pit, fruit trees, a pool, spa, rock grotto, waterfalls & slide, the patio truly redefines the resort experience. Inside, there is an office with built-ins & bonus/playroom. For those with a penchant for cooking, the kitchen sets the perfect stage with its massive center island, extensive granite counter tops, as well as commercial grade stainless steel appliances including both 6-burner Wolf Range and double-stack convection ovens, & SubZero refrigerator. The adjoining dining area & family room with fireplace & massive 3-TV media unit opens directly to the loggia for an effortless indoor-outdoor flow. Lot Size: 0.3 Acres / 13037 Sq. Ft.
SchoolsClick map icons below to view information for schools near 4657 Ponderosa Way Yorba Linda, CA 92886. 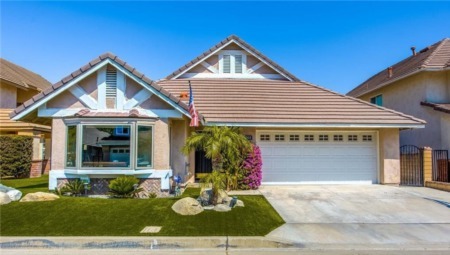 Listing provided courtesy of Frank Del Rio, Coldwell Banker Res. Brokerage.